Col Russ Hanthorn was the evening's presenter. Russ has had a long and distinguished career in the Marine Corps, commissioned in 1958, and retired 38 years later as a Colonel. 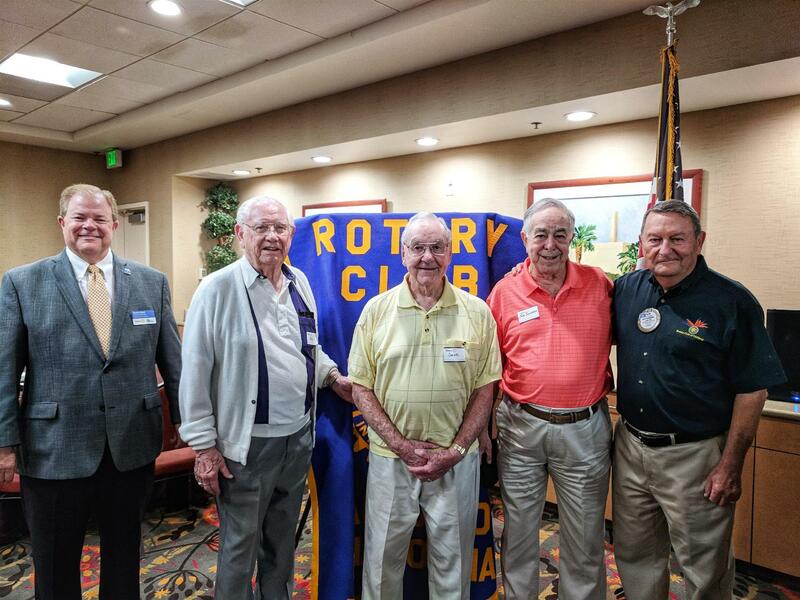 Russ was President of Carlsbad Rotary in 1989-90 and has served our club as a Director in all avenues. He has also served Rotary at the District level. In 2003-2004, Russ was District 5340’s Rotarian of the Year. Russ’s subject was the Annual Veteran’s Day Military Review, jointly sponsored by Carlsbad Rotary and Army Navy Academy. This year it will be on Saturday, November 11, 2017 – 11:30 am to 12:30 pm. at the Army & Navy Academy’s Bliss Stadium, 2600 Carlsbad Blvd. Now in its ninth year, it has become one of the top events honoring the armed forces in all of San Diego County and is Carlsbad’s official Veterans Day observance. This community event is open to the public free of charge. You are invited to attend.